SIOUX CITY, Iowa (CNS) — Micah Herbst of Sioux City does not have a son on the football team at Bishop Heelan Catholic High School. But her quick eye — that caught a contest through her employer — resulted in the Sioux City school being one of 10 high schools in the country to receive free Shockbox helmet sensors for their football teams. The technology, according to the manufacturer, is designed to help coaches and parents better diagnose potential concussions. Herbst, whose daughter Brooke is a 2013 Heelan alum and daughter Claire a current freshman there, learned about the contest, “Progress Is: Playing Smart,” through her employer, Progressive Insurance Co.
A written submission was to be completed reflecting on why the team was in need of the sensors and how they would have an impact on the football program. Herbst knew Andy Foster, assistant activities director at Heelan, and shared the contest information with him. In late October, the Crusaders received the notification the school was one of 10 winners to receive the 11 sensors, which retail for about $200 a piece. Concussions in football have made national headlines — including the recent suicide of Ohio State football player Kosta Karageorge, who disappeared after sending his parents a text message about his concussions — based on the increase among players and the long-term damage frequent concussions can cause. According to Dan Nelson, Heelan’s certified athletic trainer, the sensors arrived with just two games left in the season. 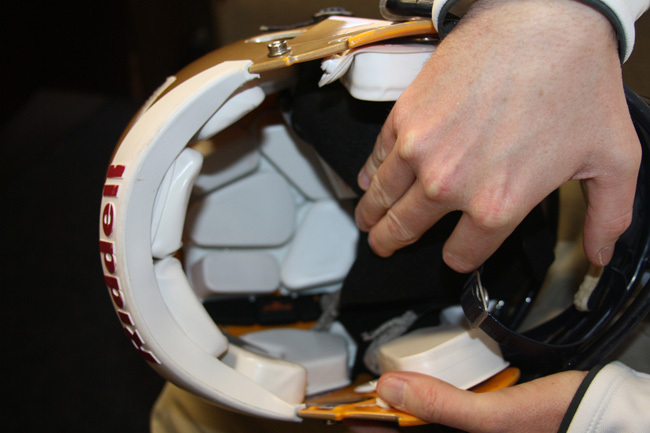 The impact sensors are attached to the inside of the crown of the helmet with a piece of Velcro. Nearly a dozen Bishop Heelan players wore a helmet sensor, which sends instant wireless information to Nelson’s smartphone app about a player’s hits and if a head impact could result in a concussion. The sensors show how many hits the player is taking, the intensity of the hits, and the direction from where the hit originated, such as side, front, back, Nelson explained. What the sensor cannot do is diagnose a concussion, Nelson said. Nelson reported the players were very interested in the sensors.